BioWare's Dragon Age Uber Lot eBay auction to benefit the Child's Play charity is coming to an end, but there's still time to get your bid in - as long as you don't mind paying more for a videogame than you would for a car. 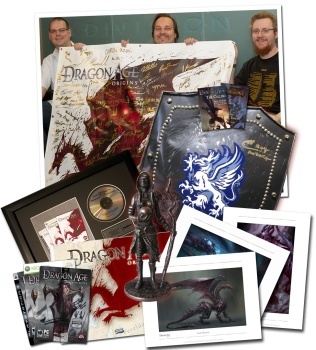 The Dragon Age auction for Child's Play is undeniably sweet. This isn't the sort of loot you get for pre-ordering a collector's edition at GameStop; it's the kind people kill for. A calendar, mug, novel, figurine and water bottle are just the tip of the iceberg. Unfortunately for anyone interested in loading up on some one-of-a-kind Dragon Age swag, this iceberg is very, very expensive. How expensive? At the time of writing, it'll cost you $4107 to place a bid. Yes, that four thousand, one hundred and seven freakin' dollars just to get your foot in the door. And there's still eight hours left. But surely, you might be thinking, nobody is going to drop over four grand on some calendars and coffee mugs. And you'd be right: The Dragon Age Uber Lot also includes a huge Dragon Age: Origins banner signed by the entire development team, a hardcover Dragon Age: Origins Penny Arcade comic signed by Gabe, Tycho, Ray Muzyka and Greg Zeschuk, three limited-run, autographed lithographs, collector's edition copies of the game in every format and a real live Grey Warden shield, one of only eight ever made. None of this in-game crapola - this is a real shield! I thought about putting in a bid when I first heard about this auction but when bidding jumped from $10 to $325 three minutes after it opened, I realized I was in over my head. If you're the deep-pocketed sort, though, or you just feel like drooling over some really cool stuff that you'll never, ever have, you can get an eyeful of the Dragon Age Uber Lot auction at eBay.